Thrombospondin-1 antibody LS-C18090 is an unconjugated mouse monoclonal antibody to Thrombospondin-1 (THBS1) from human and bovine. Validated for ELISA and IHC. Bovine corneal endothelial cells on beads. Highly specific for the low-calcium conformation of thrombospondin. There is no evidence for cross-reactivity with other connective tissue proteins (vitronectin, fibronectin, elastin, collagen, laminin). Cross-reacts with human thrombospondin. Other species have not been tested. The epitope is only present in thrombospondin prepared with low levels of calcium. 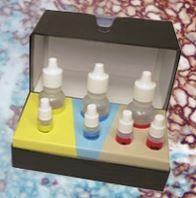 Suitable for use in ELISA, Immunohistochemistry. ELISA: 1:200. Immunohistochemistry: 1:40.